October is the time to break out your games with ghosts, monsters, and zombies. 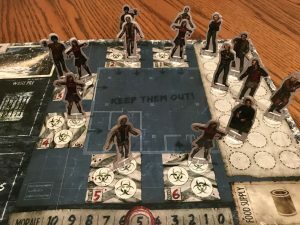 In Dead of Winter, each player controls a faction of survivors living together in the colony trying to survive the winter in the midst of a zombie apocalypse. Gameplay is a mix between cooperative and competitive play. At the beginning of the game, players choose one main objective out of a series of possibilities. Everyone works together to complete this objective (well, maybe not everyone). Each player also draws a secret objective that they must individually complete. Most of the secret objectives will add a series of other victory conditions to the main objective. However, someone might have a Betrayal objective, which requires the colony to fail the main objective. Most of the action revolves around two things: searching and attacking. Survivors search six different locations for items that might help them endure the winter – fuel, food, medicine, weapons, and more. Survivors can also attack zombies and other survivors. Every time survivors leave a location to travel to a new one or attack a zombie outside, they must roll the exposure die. On the exposure die is the possibility of nothing happening, an injury, frostbite, or even death. The game ends when colony morale reaches zero, the main objective is completed, or the round marker gets down to zero. Between main objectives, secret objectives, different survivors, and crisis cards, there are enough combinations to make the replay value fantastic. This game can unfold many different ways and it will keep you coming back. I like cooperative objectives. It is fun to team up with your friends against the game. This game adds a nice balance by having a shared main objective and secret individual objectives. It can be as cooperative or competitive as you want to make it. This game is full of choices and your choices matter. Do you rescue someone or let them die? Do you take the safe route or do you risk frostbite for a better reward? You will make some kind of choice every turn and these opportunities can create some interesting interactions around the table. If you make an unpopular choice, don’t expect the other players to let you forget it! This game takes a lot of set-up. There are thirteen different decks of cards. There are lots of different pieces to set up, whether they are survivors or zombies. There are many parts to this game, so you cannot pull it out for a quick run. Many of the main objectives are too easy. Each one is double sided, with the back side having a harder difficulty. Even still, it is often hard to fail unless someone is a traitor or things go really It’s a fun ride, but not always a challenging one. The rulebook has missing information. Most of it is some corner cases but, with a game this complex, you’re bound to run in to something. On more than one occasion, we have wanted to settle a rules issue and were unable to find the answer in the rulebook. If you have a casual group, this won’t matter much. If you have someone who likes to argue about rules, this could be a headache. 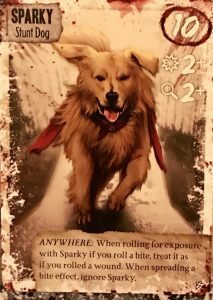 Dead of Winter has been a go-to game in my playgroup for a few months. It is a big enough sandbox to let us interact and have some creative and interesting experiences. 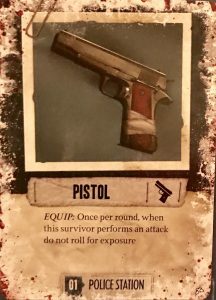 If you are even remotely into the zombie genre and you like cooperative games, Dead of Winter is a great choice to add to your collection. Looking to get your hands on a copy? Buy one here at TEG! This entry was posted in Articles, Board Games and tagged Board Games, halloween, Review, Tom, Zombies. Bookmark the permalink.